View More In Beer Keg Refrigerators. 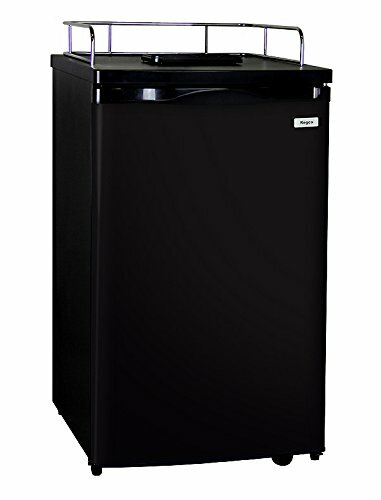 The Kegco K199B Black Kegerator Cabinet. This is the cabinet only and does not come with a draft beer dispense system. You can add a tower kegerator conversion kit to customize the setup to suit your needs. The cabinet is big enough to hold a Full Size or Pony Keg and up to two 5 Gallon Kegs.The Kegerator Cabinet includes a chrome guard rail to prevent glasses from sliding off the work top and a plastic drip tray. Casters are provided so that you can easily move the cabinet from the kitchen to the patio. Two wire shelves allow you to use the cabinet as a refrigerator when not in use as a Keg Beer Dispenser. The interior of the cabinet is big enough to fit a 5lb Co2 tank along with a keg, but there is also a knockout and an external tank holder that allows you to mount the tank on the back of the unit for extra interior space.PLEASE NOTE: Coors Kegs will not fit into this Kegerator. LARGE INTERIOR: This beer keg cooler has a spacious interior that can accommodate full-size kegs (15.5 gallons), 1/4 beer barrels (7.75 gallons), and 5 gallon kegs. When you aren't using the keg refrigerator to store and dispense draft beer kegs, it can be easily converted into a regular all-refrigerator or beverage center using the two included adjustable shelves, providing additional refrigerated storage space for food and other beverages. CONVENIENT DESIGN FEATURES: This kegerator cabinet includes a chrome guard rail to help prevent glasses from sliding off of the work top and a plastic drip tray that makes cleaning up drips and spills a breeze. Casters are provided to allow you to easily move the kegerator from place to place, letting you serve ice cold draft in nearly any room of your home. A knockout and external tank holder gives you the option to mount the CO2 tank on the back of the unit to free up space. POWERFUL AND ENERGY EFFICIENT COOLING TECHNOLOGY: Specially designed for home use, this kegerator cabinet features quiet performance and a 25% more energy efficient design that delivers powerful cooling while helping to save you money each month on your utility bill. The temperature can be adjusted between 34 degrees Fahrenheit and 45 degrees Fahrenheit using the manual temperature dial conveniently located inside of the unit, allowing you to store your kegs at their ideal temperature. KEGERATOR CABINET ONLY: This is a kegerator cabinet only and does not come with a draft beer dispense system. You will need to add a dispense system before you will be able to use this kegerator to dispense draft beer from a keg.